DnBuster's Place: Stay Connected, Comfortable, & Clean with Purex + ISOTONER! Stay Connected, Comfortable, & Clean with Purex + ISOTONER! ISOTONER smarTouch gloves keep your hands warm while using your touch screen devices. Keep them bright and clean all winter long with Purex liquid detergent and WIN! 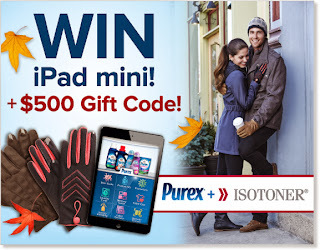 One grand prize winner will receive an iPad mini + a $500 ISOTONER shopping spree. Ten (10) runners up will get $25 gift card good towards any ISOTONER product!